LIBERAL, Kan. – The Seward County baseball team won 9-7 against Frank Phillips College in a single nine-inning game. Seward had 9 runs on 15 hits and 1 error while Frank Phillips had 7 runs on 11 hits and 1 error. Starting on the mound was Jordan Pepper. The Saints played a full rotation of pitchers today with each one pitching a single inning. Those pitchers were Brayden Conner, Braeden Gould, West Reddell, Hunter Ratcliffe, Brooks Williams, Jacob Nielsen, and Dylan Paul. Jacob Nielsen (1-0) took the win for the Saints as he allowed zero hits and zero runs over one inning, walking zero. Dylan Paul recorded the last three outs to earn the save for Seward. The Saints tallied 15 hits on the day. Brendan Madsen, Spencer Sackett, Ben Tsui, and Cruz Shope all managed multiple hits for Seward County Saints Varsity. Sackett and Madsen each collected three hits to lead Seward..
Frank Phillips got things started in the first inning when Jonathan Charles singled on a 2-2 count, scoring one run then Nicolas Ramos scoring another run when he grounded out on a double play by the Saints. Sackett comes up and doubles in the bottom of the first and scores Madsen making it 1-2. Top of the fourth and Frank tries to pull away with a three run home run hit by Duncan Chew bringing the game to 1-5 Saints trailing, but not for long. Seward County Saints Varsity pulled away for good with seven runs in the fourth inning. In the fourth Benny Ayala doubled on a 1-1 count, scoring one run, Shope singled on a 1-2 count, scoring one run, Madsen singled on a 1-1 count, scoring one run, Cole Bergdall singled on a 0-1 count, scoring one run, Sackett doubled on a 2-1 count, scoring one run, and Cayde Ward doubled on a 1-1 count, scoring two runs. The score at the end of this inning turned in Sewards favor 8-5. Madsen grounds into a fielder’s choice, but scores Tsui and brings the game to 9-5. The Plainsmen will score two more runs in the top of the seventh inning but that is where score will stay for the rest of the game, 9-7. 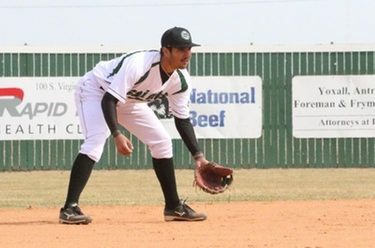 The Seward County baseball team is now 14-9 overall and 2-2 in conference as they head into a double header at home against Colby Community College Thursday, March 15th at Brent Gould Field at 1:00 and 3:00 pm.